The biggest mistake people make when training legs, aside from not training them at all, is neglecting to focus on the development of all the major leg muscles. In this article, you’ll learn the best leg exercises and most optimized leg workout based on scientific literature and our understanding of the leg muscles. Let’s start by first understanding the anatomy of the leg muscles. The 3 main muscle groups we will focus on are the quadriceps, hamstrings, and glutes. The quads are a group of four muscles that comprise the bulk of the muscle on the front of the thigh. The hamstrings are comprised of three muscles that make up the muscles of the back of the thigh. Together these muscles work mainly to extend the hip and flex the knee. Now that we know a little bit about the anatomy of the legs, we can look at what the most effective exercises for each of these muscles might be. I think there’s no surprise that barbell squats are in here. They are an excellent exercise for simultaneously working pretty much all of your lower body musculature (Check out other lower body workouts here). The quads and glutes are the primary focus of this exercise The hamstrings and several other muscles act as dynamic stabilizers throughout the movement. 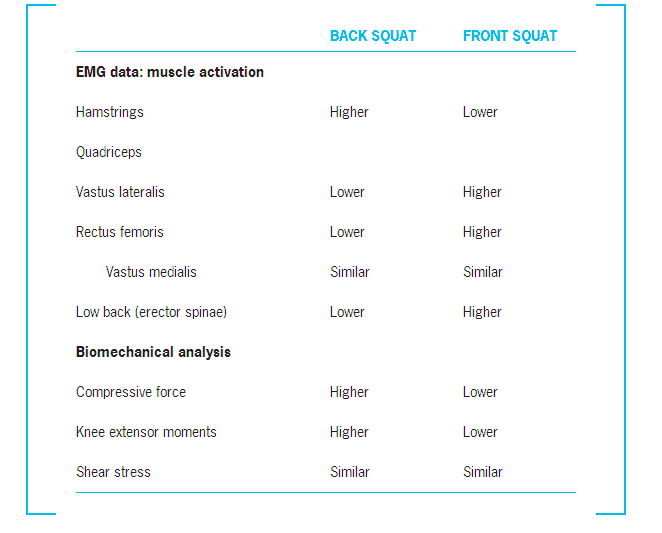 As for squat depth, one study by Morse et al. found that there was a two-fold increase in muscle size in subjects that performed full range of motion squats as opposed to partial squats over a period of 8 weeks squats. And as shown in this study by Bruno et al., full range of motion seems to induce greater muscle damage than partial range of motion even if more volume is lifted in the partial range of motion. So you definitely want to use a full range of motion if your goal is leg hypertrophy, which means you want to come down to at least parallel when you perform the squat. As for performing them with a barbell versus a smith machine, one study by Binsted et al. showed that barbell squats elicited 43% higher average leg muscle activity when compared to smith machine squats. So in summary, stick to full range of motion barbell squats for the best results! There are several reasons why I’m also including front squats in this routine. Not only do they hit all of the major muscle groups of the legs very well, especially the quads, they also emphasize a lot of upper body musculature people tend to be weak in. These muscles include the serratus anterior, lower traps, and rhomboids which function to keep the bar up to prevent you from falling forward. These muscles are essential for maintaining proper posture during lifts and even just correcting posture outside of the gym. In addition to this, although surprisingly studies show that overall quadriceps activation is pretty much the same between the front and back squats. Research also shows that front squats may emphasize certain quad muscles that aren’t activated as well during the back squats. For example, this table from a study by Tillman et al. shows that certain quadricep muscles like the vastus lateralis and the rectus femoris are less activated during the back squat and moreso in the front squat. Thus, indicating that performing front squats as well as back squats may provide more balanced quad development. However, with that being said if you think including both in one workout is too fatiguing, then you can put them somewhere else in your workout split. Another option is to replace them with hack squats or leg press which both show similar results in terms of hitting all the quad muscles. This exercise is something I think everyone should include somewhere in their routine. Again, this exercise will hit all the major leg muscles but is more of a hip-dominant exercise (meaning it will target the posterior chain more heavily). Research shows that this exercise more heavily involves the hamstrings and glutes than the squat. Meaning it’s essential to include in your leg routine for development of these muscles since they aren’t as well activated during the squat. In addition, this study by Turner et al. 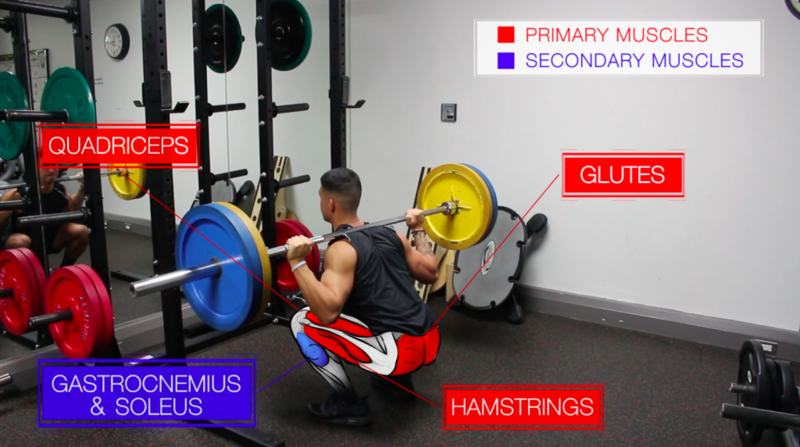 suggests that the split squat may be as effective at increasing back squat 1RM as the back squat itself, while placing less strain on the lower back. Meaning that it’s a great complimentary exercise to use with squats in terms of muscle and strength development. And the fact that it’s a unilateral exercise helps balance out asymmetries that would likely develop from using only bilateral exercises like squats and leg press. One thing to also keep in mind is that when it comes to hamstrings, Romanian deadlifts really are king in terms of EMG activation (as shown here). So you definitely want to include them somewhere in your routine. It can be on your back day or on another leg day in order to balance their development with the quads. I would advise against adding them to this workout unless your accustomed to high volume workouts. The next exercise is essential in order to activate and hit the glutes to a greater extent than they are in the squat. The main muscle worked in this exercise is the glutes, but the hamstrings will also be involved. 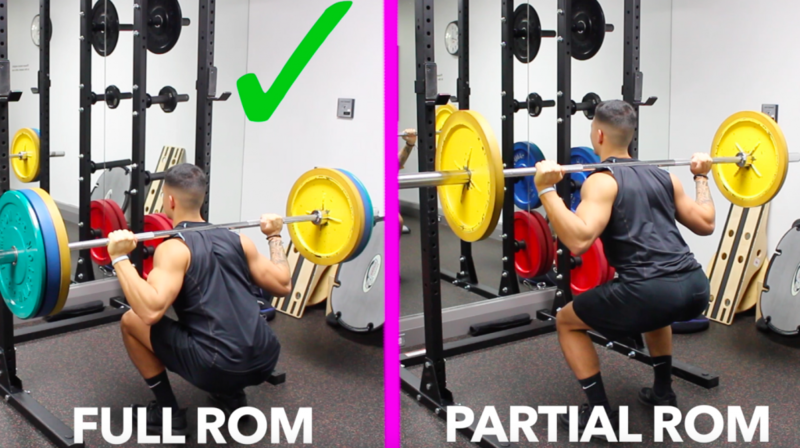 The reason these are essential for glute development is a topic that has been explored extensively by researcher Brett Contreras (the “glute guy”). He found that mean activation of the glutes during squats are fairly low, only around 50-70% of your maximum voluntary contraction. Whereas for hip thrusts using the same relative load, mean activation is extremely high. Around 100% of maximum voluntary contraction AND it better activates the upper fibres of the glutes. Therefore, they should be used complimentary with squats for the best glute development. If you haven’t done these, I suggest performing them with no weight just to get the movement and activation down. Then you can progress it by adding weight. As for the optimal rep range for legs, research shows that the legs are comprised of almost an even split between type I and type II muscle fibers. However there is a slight tendency towards a higher proportion of type I muscle fibers. Generally, it’s thought that high reps with low weight maximize type I fiber growth and low reps with high weight maximize type II fiber growth. Some studies agree with this however others show that both fiber types will grow regardless of the rep range used. But I think that research is still leaning towards including a mix of both low rep and high rep work for legs. Given their fiber type distribution, so I think that would likely be the best option in terms of hypertrophy. One thing to keep in mind is the order that you perform the exercises in. Several studies have shown a trend where lifters get better gains in hypertrophy and strength for exercises that are done early in a session. Meaning you want to order exercises based on what your strengths and weaknesses are. If your quads are lagging, do the workout as posted above. This will help prioritize weaknesses and help balance out your overall leg growth. And as always, be mindful of individual variation. Different individuals respond to different types of stimulus (e.g. high rep vs low rep). So play around with the rep ranges, exercises, and volume in order to see what works best for you. This workout is just a recommendation and something for you to experiment with. Hope you guys enjoyed the post! If you have any questions, feel free to email me or leave a comment below. You can also check out the Youtube video I made for this article, which summarizes everything for you. Check it out below! Some suggested subject matter would be: Best scientific way to build with dumbbells only…Best scientific exercises for boflex and boflex revolution…Best scientific ways to build without equipment…best natural and legal suppliments to build muscle and promote recovery scientifically…and best vegan diet to build scientifically. ..best foods for building scientifically. Thanks Wade! Will keep all those topics in mind for the future. I second the suggestion about building strength with dumbells only! I’d love to learn more about that. At the moment I’m trying to get by with just single leg dumbell squats and single leg dumbell deadlifts for legs, while also using dumbells for the overhead press . I gotta say: they feel great. Really enjoying you articles. Thanks for all the work you put into them! Would love to see one like this on the Back. Thanks Rick! I’ve got a Youtube video up for back, but I’ll work on getting the article up for it up on my site sometime this week. Probably the most informative articles and videos out there. I’m looking to add mass to my legs. One a day in the gym – leg curls, leg extensions and leg press. Another at home with a barbell back squat. Is that enough leg work? Thank you! Yes, focus mostly on progressive overloading the back squat. I’d even do the back squats 2x/week in your case. 2 sets of 10 reps bodyweight squats holding the position low to help warm up. 2 sets of 5 reps 56 kilos. me to achieve some leg mass? I’m not looking for anything outrageous just a little more bulk. Yes, I’d do less warm up sets leading up to your heavy sets though so that you can do more at a heavier weight. Great work dude! I have been following your workout routines as I am a fellow scientist myself and I have to saw I am really impressed by the clarity and the quality of your presentations. If you can provide a workout routines to compliment certain sports, for example football, tennis, volleyball and so on, I think that it would be great for people who want two get maximum performance at the gym, and at the same time have this synergy between both actual sport and fitness. Will keep that in mind! Thanks! Great blog, I actually go out of my way to remove adblocker on your website! Congratulations, Jeremy! I really like when the professional works based on scientific evidence. I wanna know if it is necessary to do specific exercises for adductors and abductors muscles in a legs workout to complement thoses exercises showed above. It’s necessary in some cases if there’s an imbalance. But generally these exercises are sufficient to hit the adductors/abductors as well – some additional glute medius exercises would be helpful and is something I’ll make a video on. I will definitely cover that topic in a future article/video! Thanks!